AWESOME VINEGAR & GARLIC ALPINE ITALIAN DRESSING FOR SALADS, SANDWICHES & ALPINE PIZZA WITH ONLY ALPINE DRESSING, MOZZARELLA CHEESE, & PIZZA CRUST. LINDENLOFT'S FAMOUS ALPINE PIZZA. SOME PEOPLE DID LIKE TO ADD TOPPINGS LIKE HAM, OR PEPPERONI, OR ANYTHING, BUT NO RED PIZZA SAUCE. PIZZA HUT BOTTLED IT IN WICHITA, KANSAS AND SOLD IT WITH THE LABEL OF PIZZA HUT ITALIAN. IT WAS SOLD TO OTHER RESTAURANTS AND IN GROCERY STORES IN WICHITA AS SWISS CHALET ALPINE ITALIAN. YOU CAN BUY 8 OZ. BOTTLES OF IT AT SIMPLE SIMONS PIZZA IN FT. GIBSON. 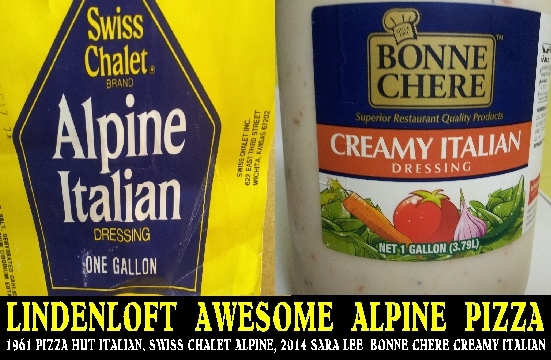 SWISS CHALET WAS LATER SOLD TO SARA LEE AND NOW BOTTLED UNDER THE LABEL OF SARA LEE BONNE CHERE CREAMY ITALIAN. NO OTHER ITALIAN DRESSING TASTES ANY THING LIKE ALPINE ITALIAN. YOU CAN GET IT ON BUFFET AT PISANOS PIZZA IN MUSKOGEE AND URBAN STATION IN FT. GIBSON.